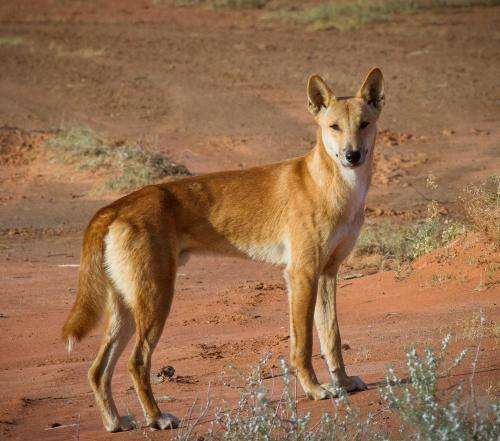 "Our approach is purposefully bold because only an experiment on this scale can resolve the long-running debate over whether the dingo can help halt Australia's biodiversity collapse and restore degraded rangeland environments," said Dr Thomas Newsome from the School of Biological Sciences at the University of Sydney and lead author of an article published today in Restoration Ecology. Written with Dr Newsome's colleagues from the University of Sydney and other universities in Australia and in America, where he completed a Fulbright Scholarship, the article outlines how the experiment could be undertaken. "Half the world's mammal extinctions over the last two hundred years have occurred in Australia and we are on track for an acceleration of that loss. This experiment would provide robust data to address an issue of national and international significance," said Dr Newsome. "Our approach is based on dingoes' ability to suppress populations of invasive predators such as red foxes and feral cats that prey on threatened native species. Dingoes can also control numbers of introduced species such as European wild rabbits, feral pigs and goats or native herbivores such as kangaroos, that in high numbers can contribute to rangeland degradation. "There are major challenges, including convincing livestock producers and local communities to support the experiment, but we currently have almost no understanding of the impact of increased dingo populations over large areas. "It took 20 years of debate in America before wolves were reintroduced into Yellowstone National Park and central Idaho - so let's start having the conversation." "Large carnivores such as wolves, bears, lynx and wolverines are returning in many parts of the world, especially North America and Europe. The future survival of large carnivores will depend on our understanding of their potential to increase biodiversity, local tourism and the health and productivity of ecosystems," said Dr Newsome. "Just one possibility is that if dingo recolonisation to Sturt National Park successfully lowered numbers of feral cats and red foxes we could test whether this assists the reintroduction of locally extinct native mammals such as the greater bilby and burrowing bettong." Who's afraid of the big bad wolf: Is the dingo friend or foe? "Bold" being used where "insane" would be more accurate. Dealing with foxes, cats and wild dogs (not dingoes) directly makes more sense than introducing another predator in the hope that it will help.